Things are getting seedy at the Annapolis Royal Historic Gardens, and that is a great thing! On April 27th from 9am -12noon the Historic Gardens is hosting their first annual Seedy Saturday. Part of a national movement started by Seeds of Diversity, Seedy Saturday is an opportunity for those interested in plant propagation, open pollination, heirloom seeds, locally grown produce and all things seed related. For those looking to get a start on the growing season, local seed and seedling vendors will be on site as well as a community seed swap. Families can enjoy pumpkin planting and a Seedy Saturday scavenger hunt. Vendors at the Annapolis Royal Winter Farmers Market will have their usual delicious selection of food and drink. We also have a local expert teaching about monarch butterflies and pollinators with milkweed seedlings available. In addition to Seedy Saturday, there are some other garden related events happening in the Annapolis Royal region on the same weekend. On April 26 at the Granville Ferry Community Hall there is a public demonstration of “The Art of Ikebana” (Japanese flower arranging). The following day there is an Ikebana workshop at the same location (preregistration: mayflowergardens@ns.sympatico.ca). Also on April 27th, Niki Clark, Ph.D. will share secrets of her success at seed sowing, seedling management, harvesting and handling post-crop seed in a hands-on workshop at the Lower Granville Hall in Port Royal (preregistration: GardenofGoodCheer@gmail.com). Seedy Saturday at the Historic Gardens has something for everyone from the first timer to the master gardener and seed saver. This is a great chance to meet other seed savers and discover what is happening in our community. Be sure to bring your seeds for the community swap table. 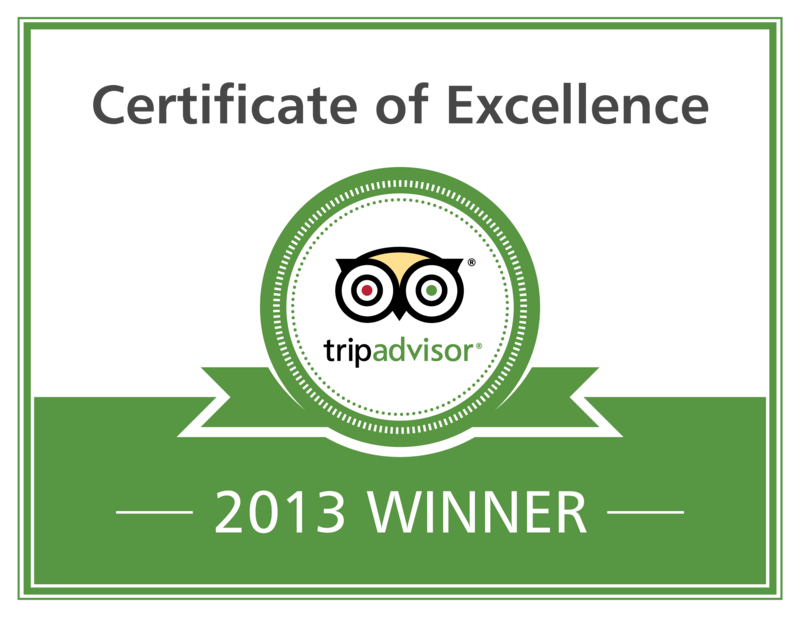 For more information please email admin@historicgardens.com or call 902-532-7018. Much to the delight of our visitors, we were able to exhibit several Witch Hazel cuttings at an event recently, taken from the shrubs at the Annapolis Royal Historic Gardens. This one is ‘Arnold Promise’, one of the Arnold Arboretum’s most famous plant introductions. We really love its striking yellow tendrils, and always look forward to it blossoming in the Gardens in late winter. Another of our noteworthy trees in the Annapolis Royal Historic Gardens is the Cedar of Lebanon (cedrus libani). A slow growing tree that can live thousands of years, the Cedar of Lebanon has existed in the world for many millennia and is often said to have been planted by God. (Ours, of course, is still very young by comparison!) There are many biblical references to the Cedar of Lebanon – a symbol of strength, beauty and majesty. A mature Cedar of Lebanon has a massive trunk, a flattened top and broad spreading horizontal branching. Lower branches typically remain on the tree as it ages, often touching the ground. It is a slow-growing tree that will typically grow to 40-60’ tall. The needles resemble those of the larch, but are evergreen. The needles are grouped in tufts of 30-40, are a dark blue-green color, and stay attached to the tree for 2 years. When they fall to the ground they don’t decay for several years. The tree has had many practical uses throughout its existence. One of the most valued construction timbers in ancient history, the wood was used by the Phoenicians to build ships, and by the Assyrians, Babylonians, Greeks, Romans, and Persians to construct houses and temples. Cedar resin was used for mummification, and its bark used for various medicinal purposes. The Ottomans used cedar wood as fuel for railway engines. And the list goes on. The tree is symbolic of Lebanon and still graces its flag, yet after millennia of harvesting the tree is in trouble. In 1876, Queen Victoria ordered a protective wall to be built around a 102-hectare grove, but deforestation continued despite this. In recent decades the cedars have been declared a protected natural resource. By then, this immense forest had been reduced to just a couple of hundred specimens that grew in a handful of isolated patches. One of the few remaining stands of ancient cedars is the “Cedars of God” located in the Qadisha Valley and is said to be the oldest remaining cedar grove in existence. In 1998 it was made a UNESCO World Heritage Site. While deforestation is not a major problem there now, climate change is a huge concern instead. Global warming has interrupted the natural ability for the trees to viably reproduce, so in recent years there has been an effort to regenerate the cedar forests through planting programs. I refer you to a great article by The New York Times about the current situation. On a blue-sky winter day like today, we will sometimes get questions from visitors about the funky tree near the street that has “dangling ornaments”. We know immediately they are referring to our London Plane (Platanus × acerifolia), a cross between the American Sycamore and the Oriental planetree. But in the winter, when the leaves are gone, one can fully appreciate other features of the tree, including the lovely “dangling ornaments” as well as the great camouflage bark. The “dangling ornaments” are its fruits which are in aggregates of hundreds in a round ball about 2.5 cm (1″) across. Many remain on the tree into winter, but eventually fall to the ground and break apart. The other really interesting feature is the bark, which exfoliates to reveal a colourful camouflage pattern. While this feature is present year round, it is often better appreciated in the winter. Our London Plane is also graced with some climbing ivy, adding even more interest. An interesting resource about the history of the London Plane is found in an article from, well, London of course! The Secret History of the London Plane Tree. 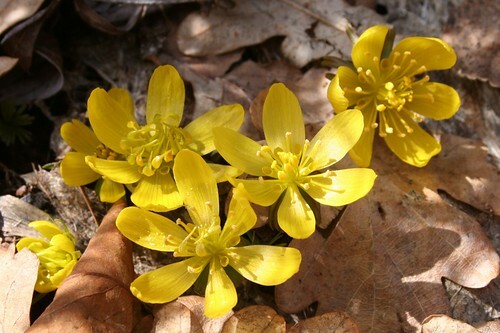 Day 84 – 25Mar2011 – Winter Aconite, originally uploaded by Historic Gardens. Project 365 HG – Winter Aconite. Day 83 – 24Mar2011 – Purple Heath, originally uploaded by Historic Gardens. 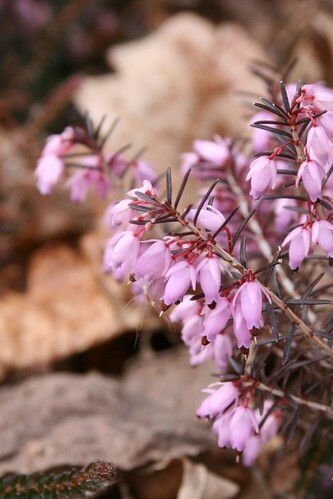 Project 365 – Purple Heath. Day 83 – it is so nice to have the Gardens at my disposal again for my daily shot, and with another spring season upon us there is no shortage of brave little bloomers to photograph!